I have to admit, things have been going well lately. My 5th installment on passion-based learning, posted on Powerful Learning Practice’s blog was selected for a March’s Editors Choice Content Award by SmartBrief. The manuscript for my first book, Digital Student Portfolios, looks more like a real book every day. The weather in Wisconsin allowed the students to wear T-shirts during recess today. Like I said, very little to complain about. These precipitating events helped ease the rejection of my article for the summer edition of Educational Leadership. Tentatively titled “Digital Book Clubs”, I wrote a narrative piece about how the students, staff, and parents in our school have all participated in accessing online resources as we engage in reading. I had a few people read it ahead of time; they thought it was a worthy submission. What also helped in dealing with the fact that my article wasn’t good enough to make the cut was the feedback provided by ASCD. “I’m sorry to report that yours is one of the very good manuscripts we cannot publish. Because you have put so much work into this piece, I hope you will submit it elsewhere. Our editors gave it high ratings.” Although not specific to my article in general, the effort was appreciated. 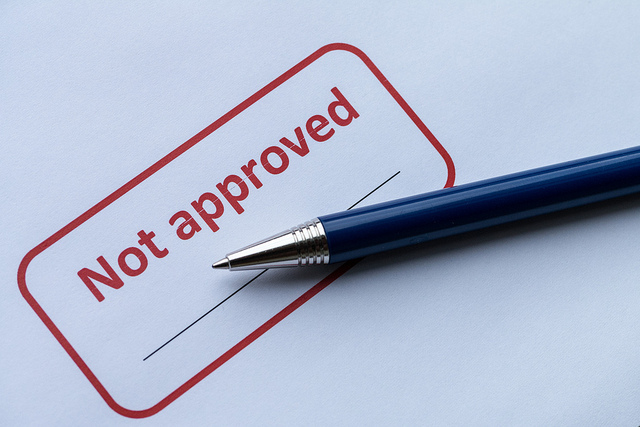 This rejection is not my first nor my last. I am sure I will submit something in the future to Educational Leadership. What I can hang my hat on is that I was a learner of my own practice through the act of writing. What I learned during this process was invaluable, from drafting the initial piece, to revising and editing it to make it submission-ready, to subsequent revisions to improve upon it even more. As I came back to the text, each time I found an idea that led me back to why we tried these practices in the first place. The difference in the spelling of “rejection” and “reflection” is only two letters. Maybe this is not a coincidence. My son recently tested for his next level in taekwondo. Before all the students test, they are asked a series of questions, in order to assess their understanding in areas such as the offensive and defensive moves in their new form. What is the meaning of your form? How many moves are in your form? The last question is a personal favorite :). It’s knuckle push ups for those with messy rooms. Responsibility is applied conceptually within my son’s program. Students are also expected to perform their newly acquired knowledge and skills. 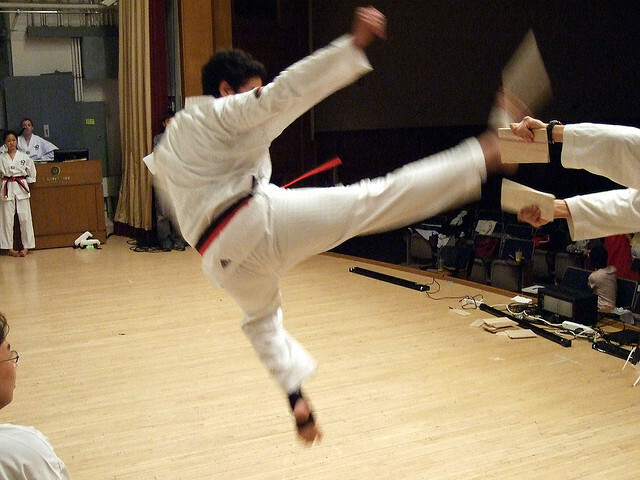 Mastery is shown by displaying accuracy in their moves and through board breaking. If a student does not successfully break the board the first time, or if their form is not up to snuff, they try again. And again. And again. No student is left behind. They were invited to testing day because the instructors felt they were ready. Some students are not encouraged to test even though they are eligible; the instructor felt they needed more practice before this summative assessment. When it is time for students to show what they know, is failure in option in our classrooms? If a student is not ready to test, do we allow them more time to prepare? At the end of this roll call, the master instructor quietly laughed and shook his head. “I used to teach physical education. When I taught, all we had were letter grades.” His comment hit home. In my own school, we report out two different types of grades: letters (A to F at 5th grade) and numbers (4 to 1 in K-4). In our effort to be more accurate in our assessments, we sometimes muddy the waters in what is considered mastery. Schools would be wise to look to extracurriculars when trying to better represent student performance and progress. Taekwondo, and I suspect other martial arts, are a great example. 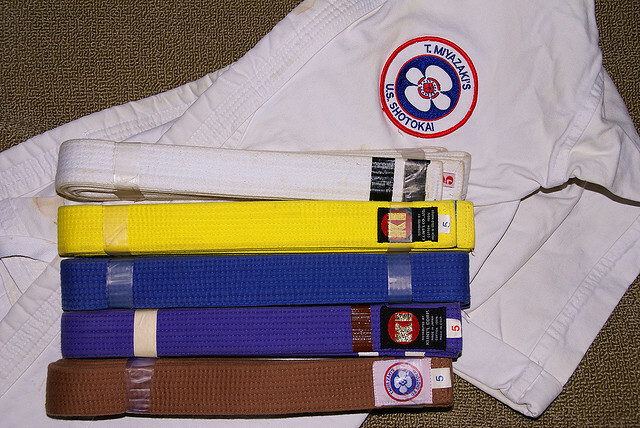 For each belt, it is very clear what the student has to accomplish in order to don the next color. There are specific kicks, combinations, and forms that must be learned to move on. These skills are an iteration of a broader learning progression; one set of learning targets is built upon knowledge both previously attained and yet to come. Also, the athletic ability is not as important as the adherence to the criteria for achievement. Students are not compared to one another. Their performance is as much about personal bests as it is about mastery. When we grade students, is our final assessment based on a common standard? Are we calibrating our judgment through collaboration? Are we comfortable giving an “A” to two different levels of understanding and performance, as long as both learners met the criteria for mastery? Encourage self-comparisons and avoid comparing students’ achievement with that of other students. When done right, it seems school and martial arts have much in common.